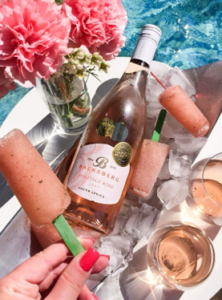 The maiden vintage of Backsberg’s Pinotage Rosé, recently earning a Double Gold medal at the 2017 Rosé Rocks Competition, is the ideal wine to enjoy with summer fare. 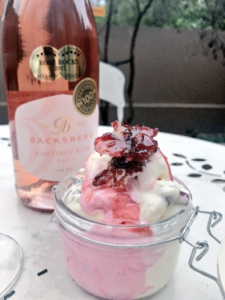 To add even more excitement to the introduction of this wine to Backsberg’s portfolio, several esteemed food and wine bloggers accepted the #MyBacksbergRecipe food and wine challenge, creating the ultimate recipe to pair with the Pinotage Rosé. Goody boxes were delivered to twenty contestants, including the Rosé and a “secret ingredient”, dried cranberries, which had to be used in their recipes. No other rules restricted the contestants, allowing them to create any dish to pair with the wine. During a live tweet-up, the #MyBacksbergRecipe campaign gained more than 2.5 million impressions and trended in second place on Twitter in South Africa. Simon Back, CEO of Backsberg, was stunned by the talented competitors’ creativity. Wow, some real deliciousness coming through on #MyBacksbergRecipe. Well done to all the participants! The first runner up was Leanne Beattie, followed by Jeff Siepman in second place. 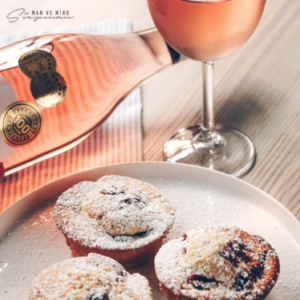 Be sure to follow Backsberg on social media for similar events in 2018 and don’t forget to view Anel’s fabulous recipes below. The Pinotage Rosé is available at the Backsberg tasting room or online store at R55 a bottle. Perfect for the upcoming festive season! Caramelise the chopped red onion and sugar in a pan with the vinegar. 1. Start with the standard two slices of bread. 2. Spread one side of each slice of bread with butter. 3. Place a slice (buttered side down) into the jaffle pan. 4. Add 2 slices of Camembert cheese to the middle. 5. Add red onion relish and top with another slice of cheese. 6. Close the jaffle iron around the sandwich, cut off the excess, because it will burn. 7. Heat over a small flame or coals. 8. Once hot, it will toasts the bread evenly. 9. 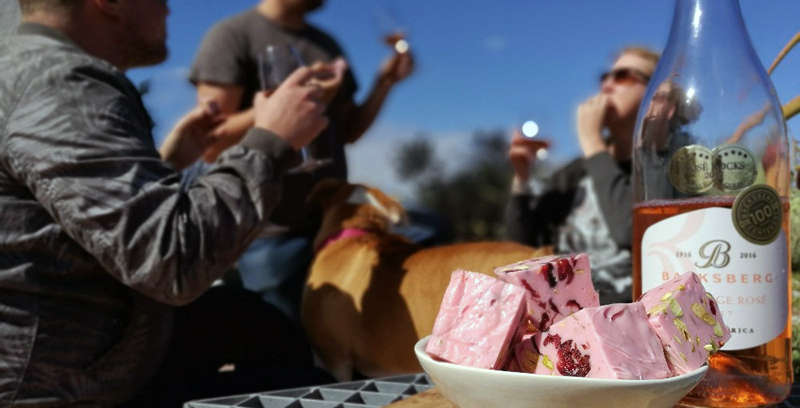 Wash the jaffles down with Backsberg Pinotage Rosé. 1. Line 8-inch square pan with foil, with ends of foil extending over sides; spray with cooking spray. 2. Melt marshmallows and chocolate in medium bowl on the stove over boiling water. Stir in nuts and cranberries. 3. Pour into prepared pan; smooth top. Refrigerate 30 minutes or until firm. 4. Use foil handles to remove nougat from pan; peel off foil. Cut nougat into 2-inch squares.